On my first time visiting London’s East End, I fell for the neighborhood hard and fast. Walking through the Old Spitalfields Market and making my way through Shoreditch, I knew this was my kind of spot. The London neighborhood is generally considered one of the coolest and it can definitely hold its own among the world’s most hipster cities. Brick Lane may be touristic but that doesn’t have to be a bad thing. 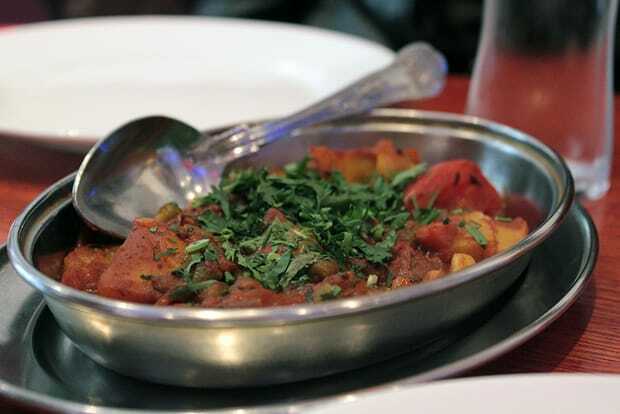 East London has long been the home to many ethnic cultures from around the world, and around Brick Lane you’ll find authentic Indian, Pakistani and Bangladeshi restaurants. Go for a curry where you can haggle for the price of your dinner, bring your own drinks and enjoy the vibrant atmosphere. On one tour in East London you even get the chance to enjoy a sit-down meal at one of Brick Lane’s more famous restaurants. Check out more photos and a review on A Dangerous Business. Along Shoreditch High Street you’ll find shop-after-shop selling name-brand clothing. But if you look close enough, there are plenty of thrift and vintage shops around as well (Beyond Retro is one of the more popular warehouse vintage stores.). Or show up to Shoreditch on a Sunday during the Sunday (Up)Market at the Old Truman Brewery. Over 100 stalls set up here selling everything including ’70s bell-bottoms, vintage shoes, trendy t-shirts from local indie designers and even arts, crafts and music! 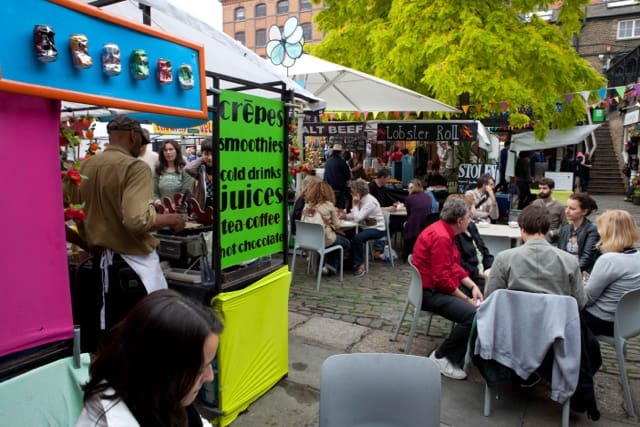 The Brick Lane Sunday market is also a great place to find some used goods if you’re looking for a bargain. Perhaps because of East London’s amalgamation of cultures, or perhaps just because the East End was always a bit of a dump, the streets here are covered in graffiti and street art. 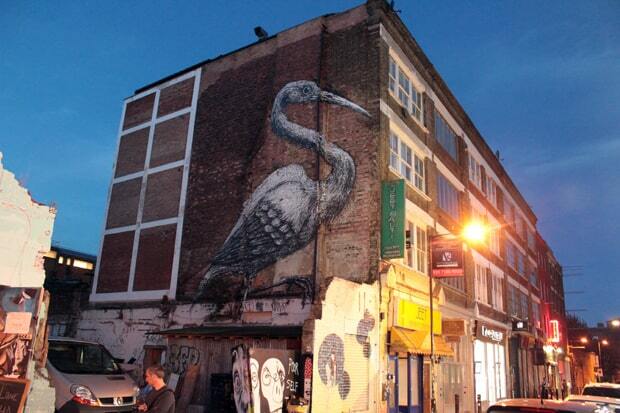 Banksy has left his mark in several places throughout, but you’ll also spot big London names such as Ben Ein or Stik. 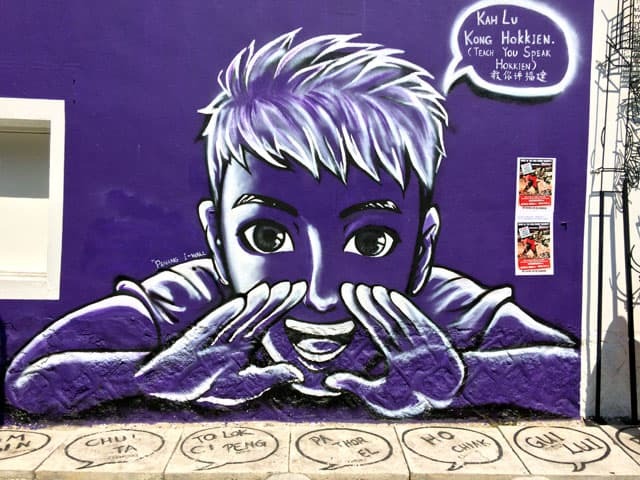 If art’s your thing but you find museums and galleries too stuffy, try taking a London street art tour. The Street Art London tours can be done either by foot or on bicycle. Has there ever been such a pretty street market before? I think not! 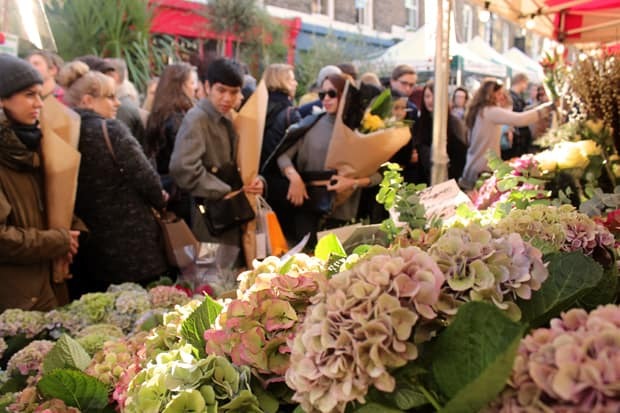 The Columbia Road Flower Market each Sunday transforms this quiet suburban street into a bustling smorgasbord of sights, sounds and scents. Street buskers perform, bars and pubs open their doors, and flower-sellers set up stalls hawking plants and flowers. There’s a bit of a quirky atmosphere here. On a Sunday when I visited the Flower Market, I saw everything from fresh oysters to accordions among the lively street market. It can be crowded directly on Columbia Road, but the side streets nearby will be just as atmospheric with half the crowd. It’s also a great place to find a typical East London pub to pass the time. Nightlife in East London is some of London’s best. Rather than the posh clubs in central London, the ones in the East End are much more down-to-earth. Sure you’ve got your pretentious hipsters, but don’t let that keep you away. There’s the pub Bar Kick where you can order good drinks at good prices all while competing in foosball tournaments. Or Loungelover, which with its oriental décor and award-winning design is as impressive as its drink list. Or further north in East London you’ll find cool clubs in Dalston — especially the Dalston Superstore (popular for its hipster gay club nights) or the Ridley Road Market Bar which is less a club and more a hole-in-the-wall café and bar located smack in the middle of an African street market. No matter your taste, East London’s nightlife has something for everyone. Which is the whole point of the East End regardless: be what you want to be, and just enjoy life. That’s the kind of place I want to visit. Adam Groffman is the writer of a popular travel blog, TRAVELS OF ADAM, which focuses heavily on the most hip and cool things to do around the world. He’s also the editor of a gay travel website, My Gay Travel Guide. Follow him on Instagram and Pinterest to discover his latest cool travel finds. Ah man! I haven’t lived around London for 17 years now. I do miss a good curry on Brick Lane! Love love love brick lane, even saw Russell Brand get hounded at by every curry house trying to invite him to eat with them – was funny to watch! London is a great place! Really missing London and the curries after reading this. East London has so much character and life about it, it should be on more people’s itineraries to visit. You perfectly described your 5 experiences. Flowers Market looks amazing, everyone must try. Spitalfields market and a Brick Lane curry is a classic way to spend a Saturday. I’ve done that with so many visiting friends. And there are some really cool bars around there too, so you can easily make a day of it. You’ve made me miss London! East London definitely has some great bars. Saturdays are a great day to be in the area, too, because there are so many markets and tours going on as well. 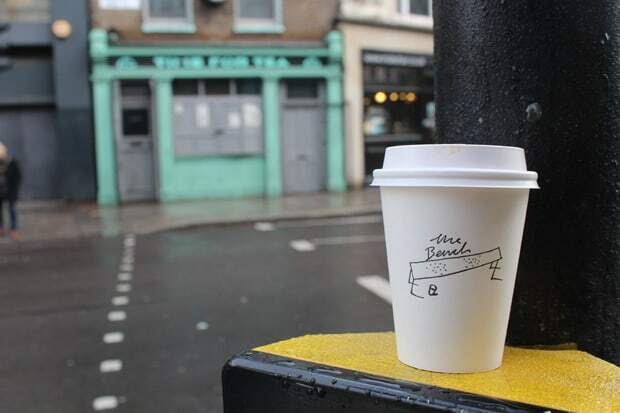 “Brick Lane may be touristic but that doesn’t have to be a bad thing.” So true! I’m so glad I visited Shoreditch for the first time on my trip to London last month. Great post, thanks for sharing. The Alternative London Tour is considered a good one, plus it’s free. London is a great city to live in and I just love that there’s so much to do and see. Have done all of the 5 things, besides the flower market. Need to give it a go soon. Yep! It’s from Aladin on Brick Lane. Discovered it on a food tour! London just has so much to offer … once I save up a bit more money, I’m there baby! It has various other attractions and an outstanding collection of world-class museums including, British Museum, Victoria & Albert Museum, Science Museum, National Gallery, Madame Tussaud’s Museum, National Maritime Museum, Buckingham Palace, Marble Arch, Piccadilly Circus and the Palace of Westminster. Hard to pick just 5 things to do, this part of London is wonderful! ← Back to one of my favorite countries. Which one, you ask?